Research Interests: U-series dating, carbonate chemistry, Fe-oxides, Mn-oxides, low-temperature thermochronology, geochemistry, volcanology, paleontology, and GIS. Currently, I use U-series dating methods to date minerals and rocks that provide ages for past earthquake events and paleo-climate transitions from the Rio Grande Rift in New Mexico. All geochemical analyses are done in the Center for Earth and Environmental Isotope Research at the University of Texas at El Paso under the guidance of my advisor Lin Ma. 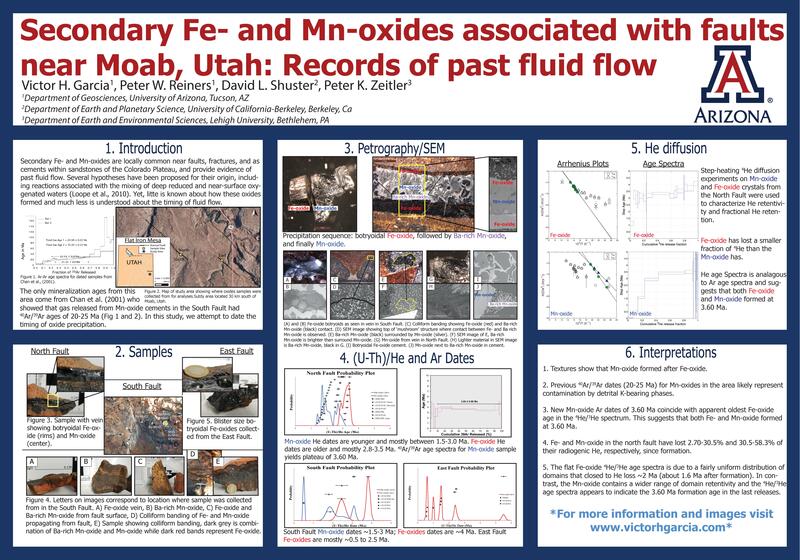 My previous rese﻿arch focused on diagenetic Mn-oxides and their potential use as geochronologic constraints of paleo-fluid flow using the (U-Th)/He system. This work was accomplished by utilizing my former advisor's, Peter Reiners, laboratory equipment in the ﻿Arizona Radiogenic Helium Dating Laboratory. Have a look around my website and if you have any questions regarding the exciting world of carbonate dating, Fe- and Mn-oxides, or any of my previous work just shoot me an email! I am officially a PhD Candidate! 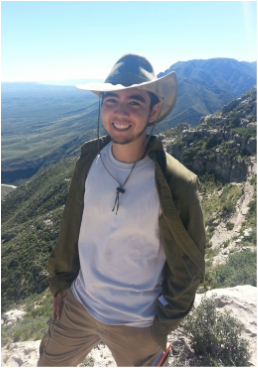 Recently, I was awarded the Dodson Research Grant, Shoemaker Scholarship, and the Jornada Basin LTER Fellowship! I will be heading back to good old Texas this fall to begin my Ph.D. work with Dr. Lin Ma at the University of Texas at El Paso. Check out my 2015 AGU Poster for the latest results on my research. Can't get enough of diagenetic oxides? Learn about diagenesis from sedimentologist Dave Loope by watching Moki Marbles Matinee, a youtube video made by Marty Pepper and narrated by the one and only Pete Reiners!